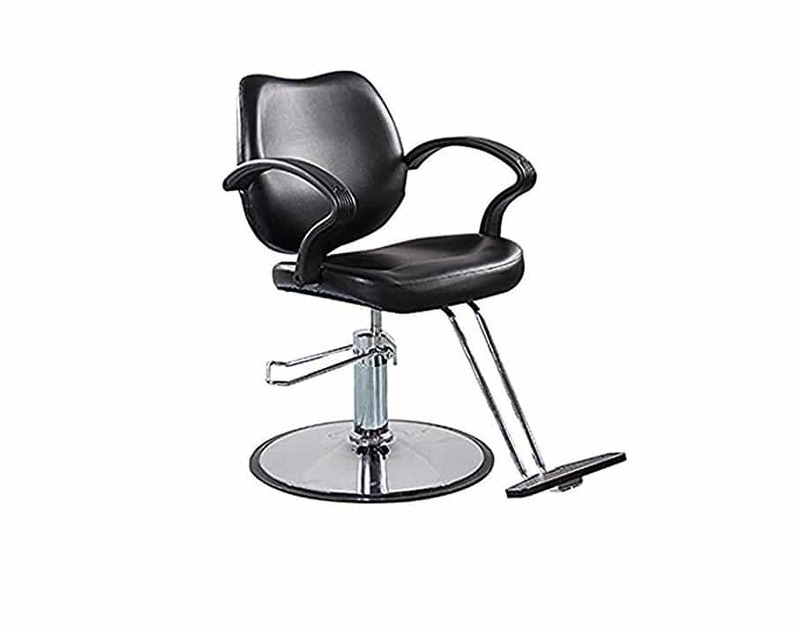 The FlagBeauty Black Hydraulic Barber Styling Chair has a heavy duty steel frame for additional support. It features a heavy scale hydraulic pump and an adjustable height level with an easy to use and access locking mechanism. This model uses small cell, high density foam to provide comfort to the padded seat. This cheap barber chair comes with a one year warranty on the pump and the base. The FlagBeauty comes with a removable footrest and removable armrests for your convenience and is suitable for use as a barbers or hairstylists basic model chair. It doesn’t come with all of the added extra features of some of the bigger brands, but our opinion is that it does the job you need it to for a cheap and affordable price. It is great value, sturdy and has smooth hydraulics with a secure lock. The footrest is adjustable to add to comfort, the black finish is sleek and stylish. Furthermore it looks sophisticated and professional while still having a reasonable price. The foam padding is comfortable but not too comfortable as a client might doze off in it. The height, of course, is adjustable. Removable arm and foot rests. Solid, stable and supportive base. Smooth hydraulic functioning for ease of use. Adjustable height and secure locking system. The FlagBeauty is very easy to assemble and comes with all the tools, parts and instructions you will need. The top of the chair is easy to maneuver and the hydraulics system works smoothly once assembled. The locking mechanism is very strong and stable, as is the base unit. The whole thing would be exceedingly hard to fall off of when the armrests are attached. Shipping was fast and simple and customer service for this product is good. In fact, FlagBeauty actively encourages you to raise issues with them so they can resolve them before you review. This is an excellent chair for the budding hair stylist or beauty therapist who wants a chair for their home. It can be used professionally as well, but if you are going to spend the money on a professional chair the more money spent the greater the rewards. Our review found that it was reasonably hard wearing and ought to last between 3-5 years, which makes it reasonably good value for money at the price. It is a good-looking chair to have in a home space or home studio. It has the dipping in the headrest where you can line it up to a sink for hair washing. Customer reviews were a little mixed but none were unhappy with the overall quality of the product and many complaints were regarding missing bolts and screws. Verified purchasers loved the ease of use and how it came together into a good looking product. Some bought it for home use specifically and have had no problems. It seems that the wear and tear of professional life might eventually break it, but that in the home it works wonderfully. The option to buy is entirely yours. Poor durability and not long lasting. Parts might be missing meaning you have a longer wait before using it. It is only available in black. The base is very heavy and difficult to move alone. Hydraulics unlikely to stand the test of time. As we briefly mentioned above the chair is easy to put together when you have the right parts. Many customers reported missing items in their packages that help in the security of the chair. Once these issues were reported and the manufacturer produced alternative screws the reviews were improved. Customers also worried at how heavy the base is – reporting that they were unable to move it far by themselves. This feature adds to the stability of the chair and balances out some of that hydraulic power. The base is also where the majority of the heavy duty pump action is embedded and this might account for the weight. At least you know it won’t tip over while you are working. There are a few quality issues with this chair but they are all resultant of the cheap price. The foam tends to sink in on the padding, the hydraulic systems wears out over time and the whole thing has a shelf life of 5 years maximum before it needs replaced. This is reflective of what you pay for it. The choice is yours over whether to save for longer and buy a better chair or buy a chair and get to work now, making money until you can improve what you have. Verified customers did not like the lack of parts, which does seem to be a consistent problem. They also said that it was hard to set up alone or move around due to the weight. Some reported that it got ‘wobbly’ after a few months. Since the warranty only covers the base there is little you can do about this. Although both the arm rests and the foot rest are removable, removing the armrests will leave visible holes in the fabric. Asides from these few small issues it makes a solid chair to start out on for the newly fledged barber. When buying a hydraulic barber chair consider the comfort of your customer. Do they have somewhere to place their cup? Are you leaning over them or can you spin them round? Can you reach them easily without hurting your back? Consider your own comfort as well. All of the features of a good stylist chair should come together to make your job easier. 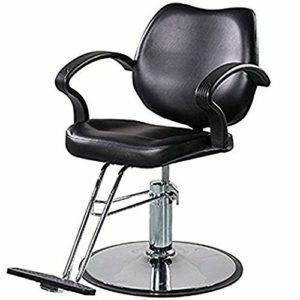 The FlagBeauty Hydraulic Styling Chair is a good model for a cheap barbers chair that you will be able to rely on. It has that adjustable height and hydraulic function that every good chair needs but comes at a cheap price by comparison to other models. It looks good in any space but is only available in black…luckily black goes with everything! This hydraulic barber’s chair is comfortable but the padding tends to sink over time. It is a model you buy to start with, and then later upgrade to something more durable. Our review found that it wasn’t as hard wearing as first glance would seem, so be wary if you want a long term chair that will last.